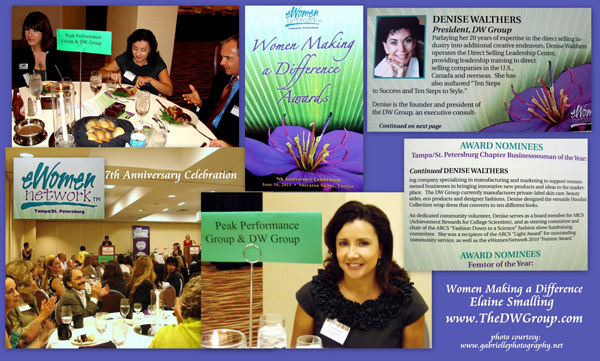 Denise Walthers was nominated for the 2011 eWomen Tampa/St. Petersburg Chapter Businesswoman of the Year. Parleying her 20 years of expertise in the direct selling industry into additional creative endeavors, Denise operates the Direct Selling Leadership Center, providing leadership training to direct selling companies in the U.S., Canada and overseas. She has also authored “Ten Steps to Success: How to Build Your Business One Step at a Time” and “Ten Steps to Style: How to Create Your Ideal Image”.